White-tailed deer season begins Saturday, Nov. 4 throughout the state of the Texas. We have personalized loan solutions to meet all your borrowing needs. WE’LL SHOOT STRAIGHT WITH YOU AND BEAT ANY PRICE ON THE ROAD! THAT’S WHY WE ARE THE LARGEST POLARIS RANGER DEALER IN THE U.S.A.
Amanda and Jesse Vann are the owners of JT’s Deer Processing located at 2931 E. Washington St. in Stephenville. Information courtesy JT’s Deer Processing. Make sure to go to Weakley Watson in person to register for the grand prize *Rules Below BIG BUCK CONTEST RULES Rifle AND archery hunters may sign up! • All state, federal, and local laws must be obeyed • All Brown county residents must register in person before November 3, 2017 at Weakley Watson Sporting Goods, 515 Early Blvd (Archery MUST be signed up for 48 hrs. BEFORE you bring your deer in until November 3th!!) • Non-Brown County residents may register by phone, 325-646-2200, or by email, tbigham@weakleysport.com, or on Facebook at Weakley Watson Sporting Goods • Deer must be killed in Brown, Eastland, Comanche, Mills, San Saba, McCullough, Coleman, or Callahan counties and entered by the person who made the kill. The entire deer must be taken in. • All deer entered MUST be scored by a Weakley Watson Sporting Goods employee. On Sundays ONLY contact Roland Pruett at 325-660-5153 for scoring. Any other day, the deer must be brought to the store for scoring during business hours. • Deer killed from high fenced areas are not eligible to win • No out of state contestants • Adult contest runs through general hunting season • Ties will be decided by the draw of a hat • Decision of Judges is final-winner subject to polygraph! Mike and Monica Wyatt are the owners of First Shot Outfitters, based in Coleman County, which offers guided hunts on a total of 600,000 acres of leased ranch property throughout the state. He no longer deals with X’s and O’s, but former high school football coach Bernie Hagins is still interested in points. Deer antler points, that is. Hagins has been a hunter since he was a child growing up in West Texas. Back then, he was focused on what was most readily available in that area — quail and dove. He began to notice that deer “started migration into West Texas” as he grew a little older. Now, at age 81, Hagins started focusing on deer hunting about 20 years ago. Each November, he travels to a private deer lease about 14 miles north of San Angelo. It covers about 250 acres, and includes some prize axis deer, Hagins said. The fenced-in lease is surrounded by other deer leases, and is relatively predator-free, Hagins said. “A fellow I coached with owns the lease. He lives in Midland,” said Hagins, who grew up in Jayton and graduated from Snyder High School. “He grew up in Bronte, and he was raised on that (lease) land. It was just me (using the lease) for a long time.” In recent years, another friend has been joining him during his hunting time. PHOTO CONTRIBUTED Bernie Hagins pictured with a buck he harvested. 0 % Financing for 84 Months* A.P.R. coin flip in Texas high school football history. Hagins said the hunting had to take a back seat to his work habits as a coach. He said he usually worked on football seven days a week before his retirement. “(Hunting) usually waited until the football season was over,” Hagins said. When Hagins does bag a deer, sometimes he donates the processed meat to places such as The Soup Kitchen in Midland. “I usually have it made into steaks,” he said. Hagins said he was friends with former Texas Tech University head football coach (1986-1999) Spike Dykes — getting to know each other first as football players and later as coaches. Dykes, who was raised in Ballinger, was highly popular for his good-natured personality and storytelling skills. Dykes died in April at age 79. “We played together at San Angelo Junior College, then at Stephen F. Austin,” Hagins said. “I was his assistant in Coahoma. Hagins said that one of his grandfathers was former Texas State Representative Joseph Hagins, and he was raised on his farm. On Select New Kubota Standard L Compact Tractors. Promotional Finance Offers End 12/31/17. *0% A.P.R., 20% down financing for up to 84 months on purchases of select new Kubota L Series from participating dealers’ in-stock inventory is available to qualified purchasers through Kubota Credit Corporation, U.S.A.; subject to credit approval. Example: 84 monthly payments of $11.90 per $1,000 financed. **Customer instant rebates of $1,000 are available with two new qualifying implements from participating dealers’ stock. 1st implement $700, 2nd implement $300. Some exceptions apply. Offer expires 12/31/17. ***For warranty terms see us or Kubota’s Limited Warranty at www.KubotaUSA.com for more information. Optional equipment may be shown. A reference to six donated deer and a small two-sentence “thank you” in the Good Samaritan Ministries’ quarterly newsletter. That’s how long-time Deer Project Committee Member Kirk Wall remembers the Deer Project taking hold on him. eer harvests are down in many areas, and the latest data from QDMA’s Whitetail Report shows some states’ buck harvests have decreased by as much as 40 percent over the past decade. bucks. Texas led the charge ahead of every other state, harvesting 330,535 antlered bucks — more than half as many bucks killed in the entire Northeast. Texas (330,535), Michigan (203,057), Wisconsin (143,738), Georgia (137,025) and Pennsylvania (134,280) at the top of the list. The top five for buck harvest per square mile, per the report: South Carolina (3.8), Michigan (3.6), Maryland (3.3), West Virginia (3.1) and Pennsylvania (3.0). ABOVE: Glen Rose High School sophomore Winston Lagergren is pictured with other members of the Waterfowl Brigade. BELOW: Glen Rose High School sophomore Winston Lagergren has taken part in several different aspects of the Texas Brigades. other people can,” Amanda said. “They don’t even have to call. Once season starts we’re open 8 a.m. to 8 p.m. and past 8 p.m. we’re open for drop-offs.” JT’s busiest time of year is deer season and they get about 1,200 deer between November and January. “We are here the beginning of October all the way through February,” Amanda said. “We would love to hit 1,500 deer this year. Some people don’t know that we’re here so we’re trying to work on that.” Amanda and Jesse enjoy their business and have plans to expand in March 2018 to offer other cuts of meat for purchase. “I like all the cutting part, I like to cut up meat. I’ve done that almost my whole life,” Jesse said. “Our goal is to have a full meat market.” Amanda added, “We’ll offer pretty much anything, fresh grind, steaks, sirloin, ribeye, strips, chicken, pork chops.” They are also planning to build a smoke house to sell smoked meats. “We have a lot of our solid customers that say they wish we would do that,” Amanda said. “So we’re going to do it. We’re going to try to get through deer season first and then get all of it going before summer hits when people start to cook out.” The official deer season is from Nov. 4 - Jan. 7 with a bag limit of four deer. For more information on hunting restrictions visit the Texas Parks & Wildlife website at tpwd.texas.gov. • Friday, Nov. 3 7:52 a.m., 6:43 p.m. • Saturday, Nov. 4 (full moon) 7:53 a.m., 6:42 p.m. • Sunday, Nov. 5 6:54 a.m., 5:41 p.m. • Monday, Nov. 6 6:54 a.m., 5:41 p.m. • Tuesday, Nov. 7 6:55 a.m., 5:40 p.m. • Wednesday, Nov. 8 6:56 a.m., 5:39 p.m. • Thursday, Nov. 9 6:57 a.m., 5:38 p.m. • Friday, Nov. 10 (last qtr.) 6:58 a.m., 5:38 p.m. • Saturday, Nov. 11 6:59 a.m., 5:37 p.m. • Sunday, Nov. 12 7:00 a.m., 5:37 p.m. • Monday, Nov. 13 7:00 a.m., 5:36 p.m. • Tuesday, Nov. 14 7:01 a.m., 5:35 p.m. • Wednesday, Nov. 15 7:02 a.m., 5:35 p.m. • Thursday, Nov. 16 7:03 a.m., 5:34 p.m. • Friday, Nov. 17 7:04 a.m., 5:34 p.m. • Saturday, Nov. 18 (new moon) 7:05 a.m., 5:34 p.m. • Sunday, Nov. 19 7:06 a.m., 5:34 p.m. • Monday, Nov. 20 7:09 a.m., 5:34 p.m. • Tuesday, Nov. 21 7:10 a.m., 5:33 p.m. • Wednesday, Nov. 22 7:11 a.m., 5:33 p.m.
• Thursday, Nov. 23 7:12 a.m., 5:33 p.m. • Friday, Nov. 24 7:13 a.m., 5:33 p.m. • Saturday, Nov. 25 7:13 a.m., 5:32 p.m. • Sunday, Nov. 26 (1st qtr.) 7:14 a.m., 5:32 p.m. • Monday, Nov. 27 7:15 a.m., 5:32 p.m. • Tuesday, Nov. 28 7:16 a.m., 5:32 p.m. • Wednesday, Nov. 29 7:17 a.m., 5:32 p.m. • Thursday, Nov. 30 7:18 a.m., 5:32 p.m. • Friday, Dec. 1 7:18 a.m., 5:32 p.m. • Saturday, Dec. 2 7:19 a.m., 5:32 p.m. • Sunday, Dec. 3 (full moon) 7:20 a.m., 5:32 p.m. • Monday, Dec. 4 7:21 a.m., 5:32 p.m. • Tuesday, Dec. 5 7:22 a.m., 5:32 p.m. • Wednesday, Dec. 6 7:22 a.m., 5:32 p.m. • Thursday, Dec. 7 7:23 a.m., 5:32 p.m. • Friday, Dec. 8 7:24 a.m., 5:32 p.m. • Saturday, Dec. 9 7:25 a.m., 5:32 p.m. • Sunday, Dec. 10 (last qtr.) 7:25 a.m., 5:32 p.m. • Monday, Dec. 11 7:26 a.m., 5:33 p.m. • Tuesday, Dec. 12 7:27 a.m., 5:33 p.m.
• Wednesday, Dec. 13 7:27 a.m., 5:33 p.m. • Thursday, Dec. 14 7:28 a.m., 5:34 p.m. • Friday, Dec. 15 7:28 a.m., 5:34 p.m. • Saturday, Dec. 16 7:29 a.m., 5:34 p.m. • Sunday, Dec. 17 7:30 a.m., 5:35 p.m. • Monday, Dec. 18 (new moon) 7:30 a.m., 5:35 p.m. • Tuesday, Dec. 19 7:31 a.m., 5:36 p.m. • Wednesday, Dec. 20 7:31 a.m., 5:36 p.m. • Thursday, Dec. 21 7:32 a.m., 5:37 p.m. • Friday, Dec. 22 7:32 a.m., 5:37 p.m. • Saturday, Dec. 23 7:33 a.m., 5:38 p.m. • Sunday, Dec. 24 7:33 a.m., 5:38 p.m. • Monday, Dec. 25 7:33 a.m., 5:39 p.m. • Tuesday, Dec. 26 (1st qtr.) 7:34 a.m., 5:39 p.m. • Wednesday, Dec. 27 7:34 a.m., 5:40 p.m. • Thursday, Dec. 28 7:34 a.m., 5:41 p.m. • Friday, Dec. 29 7:35 a.m., 5:41 p.m. • Saturday, Dec. 30 7:35 a.m., 5:42 p.m. • Sunday, Dec. 31 7:35 a.m., 5:43 p.m.
New rules for 2017-18 Texas Big Game Awards season San Antonio – Celebrating its 27th year, the Texas Big Game Awards (TBGA), a partnership of Texas Parks and Wildlife Department (TPWD) and the Texas Wildlife Association (TWA), continues to be the leader in recognizing the contributions that landowners, land managers and responsible hunters make to managing and conserving wildlife and wildlife habitat on Texas’ private and public lands. To kick off the 2017-2018 hunting season, the TBGA has re-established the program’s objectives and modified entry requirements. The purpose of the TBGA is to make everyone aware of the important role ethical hunting and habitat management play in the lives of our young people, and to the ecosystem over which we must be responsible stewards. To do that, the TBGA’s objectives are to recognize: 1. The importance of our hunting heritage. the “First Big Game Harvest” category. Hunters who harvest a white-tailed deer, mule deer, javelina, or pronghorn antelope are eligible whether they harvest a buck or doe, regardless of score of the animal in this category. And, any youth hunter (under 17 years of age when they purchase their hunting license) with a Special Resident Hunting License who harvests a white-tailed deer, mule deer, javelina, or pronghorn antelope is eligible for the “Youth Division,” whether they harvest a buck or doe, regardless of score. For more information on the Texas Big Game Awards, certified scorers list, entry rules and minimum scores are also featured on the TBGA website at www.TexasBigGameAwards. org. The website also features photos of entries, links to great TBGA Sponsors, and Trophy Search. Tikka T3X Lite .25-06 Remington 22” Barrel Blue Finish Black Synthetic Stock 3 $ Round(JRTXE317) Available300win, 7mm08, 243win, 223Rem. Winchester Super-X Ammo 243WIN-100GR, 270WIN -130GR, 270WIN-150GR,30-06-150GR, 308WIN-150GR. American Whitetail Ammo 243WIN-100GR, 25-06 - 117GR, 270WIN-130GR, 7MM-08 -130GR 308WIN-150GR, 30-06 - 150GR. ration, research and the right decoys. er in the same direction. When you set up your decoys, be sure to face them the same way. Be cognizant of how far you stake your decoys in the ground. Turkeys have short legs and understand how tall they are: Turkeys will spot a decoy immediately if your fake friend is too tall. Banded Laydown Hen Cost: $70 This decoy position is a staple in any decoy collection, and the GreenHead Gear model offers realistic features at an affordable price. decoy does more than provide double visibility, it attracts all personalities — from reticent toms to more aggressive challengers. MAD Spin-N-Strut Cost: $150 Don’t underestimate how important movement is when trying to dupe turkeys into range. This model by Flambeau Outdoors provides the hunter unparalleled control, with 90-degree rotation at the pull of a string and a fan tail that raises and lowers — with a 30-second setup time. This trail camera photo taken from one of Luke’s cameras near his home shows a couple of bucks still running in their “bachelor herd.” The buck in the front, although not fully mature, shows potential of becoming a “wall hanger.” The smaller buck in the rear, if given the opportunity could also bloom into a trophy in a few years. tunities have never been better than they are today and I am in full support of the fellow that leases 125 acres in East Texas or the ranch owner that owns an 11,000 acre ranch in South Texas. This coming week, I am making plans to join a new friend, Alan Walker on his ranch, “Next Trip Whitetails,” up in Lamar County. Walker and his partner Jason Bolen’s ranch is high fenced and intensively managed. Although I’m sure there are some monster bucks on the place, my goal is to simply take a mature animal and when visiting with Walker, I stated that if there was a fork horn on the place with 24 inch main beams, that would be my buck! The truth of the matter is, I wasn’t kidding. At this stage of my deer hunting career, it’s all about killing a mature buck and I could care less if I’m hunt a high fenced or low fenced ranch, just as long as the deer are wild! Listen to “Outdoors with Luke Clayton and Friends” on radio stations from Nebraska to Texas or anytime online at www.catfishradio. com. Perez, quail program leader with TPWD. “Hunters will likely see more adult bobwhites in the bag compared to more productive years.” TPWD projections are based on annual statewide quail surveys that were initiated in 1978 to monitor quail populations. This index uses randomly selected, 20-mile roadside survey lines to determine annual quail population trends by ecological region. This trend information helps determine relative quail populations among the regions of Texas. Comparisons can be made between the mean (average) number of quail observed per route this year and the long term mean (LTM) for quail seen within an ecological region. The quail survey was not designed to predict relative abundance for any area smaller than the ecological region. A regional breakdown of this year’s TPWD quail index survey, including highlights and prospects, is available online. Quail hunting season runs through Feb. 25, 2018. The daily bag limit for quail is 15, with 45 in possession. Legal shooting hours for all non-migratory game birds are 30 minutes before sunrise to 30 minutes after sunset. The bag limit is the maximum number that may be killed during the legal shooting hours in one day. AUSTIN – All things considered, this year’s Texas waterfowl hunting season is looking pretty favorable, according to the Texas Parks and Wildlife Department. “Currently, and potentially surprisingly, we are looking pretty good regarding the upcoming waterfowl season,” said Kevin Kraai, TPWD waterfowl program coordinator, “and that is really the entire state. Good rainfall late this summer and even more recently has conditions in the High Plains playas, Rolling Plains and Oak Prairies stock ponds and reservoirs, and even far eastern Texas habitats in better than average conditions.” The general duck hunting season resumes Nov. 3 through Jan. 28, 2018. In the South Zone, duck season runs Nov. 4-26 and resumes Dec. 9 through Jan. 20, 2018. Duck hunting in the North Zone opens Nov. 11-26 and resumes Dec. 2 through Jan. 28, 2018. Hunters are reminded that “dusky ducks” are off limits during the first five days of the season. Goose hunting also kicks off Nov. 4 statewide and runs through Jan. 28, 2018 in the East Zone and Feb. 4, 2018 in the West Zone. With the Texas gulf coast serving as winter home to 25 percent of the Central Flyway waterfowl population, habitat conditions in the wake of Hurricane Harvey were an obvious concern for waterfowl biologists. “The Texas coast obviously endured some extreme weather recently and we surprisingly saw decent early teal hunting in many places this past month,” Kraai noted. “Habitat conditions are in fair to very good shape across much of the coast just a few weeks after the storm. Recovery of these habitats has been more rapid than many of us envisioned. Waterfowl foods are abundant and improving by the day.” Wintering waterfowl supplement their diet on second growth rice crops on the coastal prairies and fortunately, much of this year’s rice crop was harvested just before the storm. It, too, is recovering and starting its second growth, which will be very beneficial to wintering ducks and geese. Planted acres of rice have once again rebounded in the Lower Colorado River drainage now that restrictions have been removed after the filling of the Highland Lakes. While habitat conditions across the coastal region are much-improved, hunters will be looking to weather forecasts of cold fronts to help push the birds southward heading into the season. “This scenario of abundant fresh water and foods across most of the state make me confident that Texas duck and goose hunters will have the opportunity to see lots of fowl this winter,” Kraai predicted. “Now we just need Mother Nature to give us a few good cold fronts and make sure our wet spots stay wet.” Hunters are encouraged to review hunting rules and requirements in the 2017-18 Waterfowl Hunting Digest before heading afield. 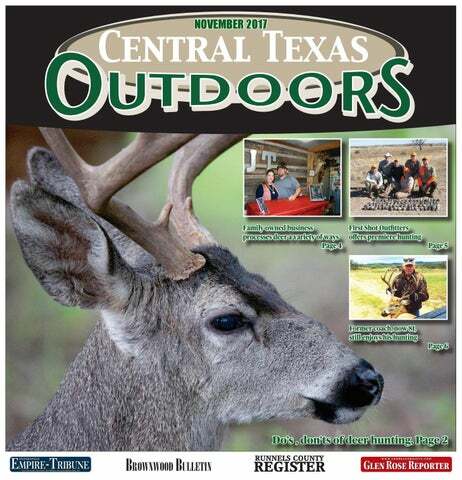 Printed copies of the digest are available wherever hunting licenses are sold and for download online from the TPWD web site. Call for Details! 888.452.8557 I kingspointcove.com Obtain the Property Report required by Federal law and read it before signing anything. No Federal agency has judged the merits or value, if any, of this property. Equal Housing Opportunity. 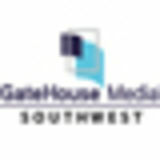 NMLS #1228042. 18 hole golf course with driving range and practice green. Full service restaurant and bar with outdoor seating. Hosting weddings, meetings, reunions and special events. Guest suites and cabins with all the comforts of home. Resort-style pool and hot tub, outdoor movies and live music. a couple dozen to 3,000 people. Five projects involved predator evaluation, habitat enhancement and wildlife surveys, and I wrote two newspaper articles and two magazine articles and was interviewed on a nationally syndicated outdoor radio show. My presentations were to such groups as Wildlife Management Associations, ranchers, 4-H, Boy Scouts, Bird Watchers, Master Naturalist Organizations, Texas Parks & Wildlife Wing Ding, Home Schoolers and the 2017 graduating class of the statewide QuailMasters Program. I found when you have to answer questions and explain topics to someone you tend to understand them much more. Hamburgers, Chicken Fried Steaks & Codyâ&#x20AC;&#x2122;s Chicken Fajita Tacos. ABOVE: Mike and Monica Wyatt are the owners of First Shot Outfitters, based in Coleman County, which offers guided hunts on a total of 600,000 acres of leased ranch property throughout the state. LEFT: First Shot Outfitters offers fine cuisine to the hunters. Here, Abbigail Wyatt prepares Almond Layered Bread Pudding a recipe which is featured in “Grazing Across Texas: Rod, Gun and Ranch Cooking” by Tosh Brown. own, Mike said. They have welcomed hunters from North Carolina, Mississippi, West Virginia, Alabama, New York and Alaska, as well as hunters from Africa and Argentina. “We built this business by word of mouth,” Mike said. First Shot Outfitters has been the location for G.O. Heath’s outdoor show called “Rugged Nation TV,” which is a hunting show that is on the Sportsman Channel. And, Monica’s delicious recipes are featured in “Grazing Across Texas: Rod, Gun and Ranch Cooking” by Tosh Brown. The hunting outfit is also featured in “The World’s Best Shoots” by Alex Brant. “In the book we have recipes such as almond layered bread pudding with Amaretto sauce, quail poppers, beer bread with honey butter, fried quail, venison stew and turtle cheesecake - all things we make and serve our hunters,” Monica said. First Shot Outfitters is also a family affair - the Wyatts’ kids help too. His son Aspin helps on the guided hunts and his youngest daughter Abbigail, who is 14, helps Monica in the kitchen. Daughters Ashley, 23, and Addi, 21, worked on the hunts before they went to college, Mike said. On the hunt for an experienced land lender? hunt from a vehicle on private property, and this promotes riding around with loaded rifles. Do not ride around with a loaded rifle. Load the magazine and don’t chamber a cartridge until you see a target animal and the rifle is pointed in a safe direction, outside the vehicle window. Handling a rifle is awkward inside the vehicle, which is what makes riding with a loaded rifle so dangerous. Aside from rifles and driving to the hunting lease (you’re far more likely to be injured by a car wreck than a hunting accident), the most dangerous part of deer hunting is climbing into an elevated blind. It’s easy to lose your balance and fall, particularly in the dark, encumbered by a rifle over one shoulder and a pack over the other. If your ladder is the least bit difficult to climb, carry your rifle (unloaded) up first and place it safely in the blind. Then climb back down for another load. Don’t forget to load the rifle once you’re situated in the blind and unload it before starting down. Metal stairways that replace vertical ladders are the best deer hunting safety development in years. Stock up on ammunition before heading for a rural hunting lease. If you have a rifle problem that requires resighting, several shots may be required. You cannot rely on a local hardware store in rural Texas to stock the brand of ammunition, bullet design and bullet weight that you prefer. and You Will Buy at Trans Texas Tire! uy at Trans Texas Tire! We offer a full line of COMPETITIVELY PRICED TIRES from the industry’s leading brands, like MICHELIN®, BFGoodrich®, and Uniroyal®. Since 1985, Trans Texas Tire has serviced the automotive repair, tire, wheel needs of customers. Our ASE-CERTIFIED MECHANICS are trained to accurately diagnose and repair automotive issues while providing you with honest customer service. Our auto mechanics ¿[ DXWRPRWLYH issues RIGHT THE FIRST TIME.